You will be paid for the total volume of your group by this Stair step plan. The Total Volume of your group can achieve by your Own Personal sales volume or Your Down line sales volume. 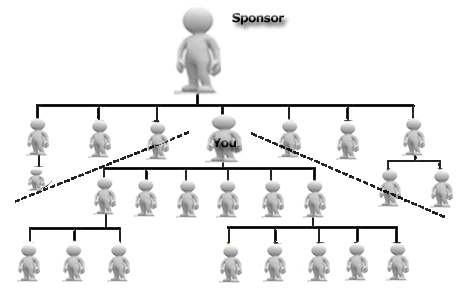 This type of plan is categorized by having distributors who are responsible for both personal and group sales volumes. Volume is created by hiring and by selling product. Several discounts or reimbursements may be paid to group leaders and a group leader can be any representative with one or more down line members. Once group volumes are achieved, a distributor moves up a step. This continues until the distributor "breaks away" from their up line. From that time onwards the new group is no longer considered part of his up line’s group - hence they are a "breakaway". Generally stair step plans have fewer commissions or more commissions but these commissions are typically a very small percentage of the overall pay-out. Stair step Breakaway plans are not level based.